The Italian works included in this volume also commence with the end of the 13th century. Although they do not fall under the heading of Gothic painting as such, they exerted an enduring influence upon the Gothic style from almost the very start — and did not remain untouched in return. Their artistic starting-point was the Byzantine Empire, which began on the eastern shores of the Adriatic and which enjoyed close political and cultural links with many of Italy's cities. A series of four Madonna panels, one by the Sienese artist Duccio di Buoninsegna (c. 1255- c. 1319), two by the Florentine Cimabue (c. 1240— after 1302), and one by his compatriot Giotto, might almost have been deliberately designed to illustrate the magnitude of the development which took place within just one generation. Three of them hang in the same room in the Uffizi in Florence. In all four pictures, the Virgin is seated on an elaborate throne. In the Duccio and the earlier of the two Cimabue paintings, this tapers illogically towards the foreground; a vague attempt at the perspectival effects achieved by earlier generations - right back to classical antiquity. In the two later works, on the other hand, the throne vanishes towards the background. The three earlier thones are ornately fashioned of wood, while Giotto's throne is constructed out of costly stone. We are suddenly confronted with an entirely new vocabulary of form. Above the sides and back of the throne, Giotto deploys pointed arches, trefoil tracery, finials and crockets - the language of Gothic architecture, in other words, already in use in France for over a hundred years, but still very new to Italy. The facades of Siena and Orvieto cathedrals, built during this same period, feature very similar elements and also employ a wealth of coloured marble and costly inlay. While Giotto's throne draws upon the decorative motifs of Islamic art, its curling leaves and scrolling tendrils simultaneously anticipate the ornament which three centuries later would fill the pilasters of the Renaissance. The very similar poses adopted by the Virgin and Child in the and the earlier Cimabue suggest that both works looked back to the same Byzantine model. The later Cimabue painting adopts a similar basic format, although the Madonna is seated slightly differently. In the Duccio and both Cimabue paintings, the figures are detailed with extreme care and the folds of their robes rendered with great subtlety. The calligraphic fluency with which Duccio drew the edges of the Virgin's cloak is underlined by the gilding. Despite their angled poses, however, with their knees bent at different heights, the three earlier Madonnas ultimately lack true physical substance. They appear to float like cutouts against their lavish backgrounds. Once again, Giotto does something entirely new. A solid body fills out the draperies; languid, delicate fingers become firm and fleshy. Where robe and body once formed an elegant unity detached from the world, so here a very earthly mother seems to have donned her costly robe purely and uncomfortably for ceremony's sake. Both feet are planted side by side firmly on the ground. In the two earliest paintings, in particular, the Virgin's face reveals the same overly wide bridge of the nose and a mouth which is much too small in relation to the almond-shaped eyes. The modelling of the face has a very graphic quality; line dominates. Thus the artist even draws in the side of the nose upon which the light falls. In Giotto this gives way to blurring shadow; a delicate gauze lies around the eyes, the forehead broadens, the veil sits higher on the head. While their closely pleated draperies reflect the ethereal remoteness of the earlier Madonnas, in Giotto both the figures and the fabrics have become heavy and solid. The Virgin's cloak falls into just a few, large folds. Although the three earlier paintings also attempt to differentiate between raised and sunken areas of fabric, the gold on and between the ridges of the red shawl draped around Duccio's infant Christ, and on the Virgin's robes in the later Cimabue, only serve to accentuate the flatness of the overall effect. Giotto, by contrast, already makes highly convincing use of light and shade, limiting gold to the no longer capriciously undulating, but largely flat hems of the Madonna's cloak. What is true of the Virgin and Child is also very much true of Giotto's angels. They are no longer surface decoration, but large, serious figures who, for all their wings, stand or kneel with their full weight on the ground. The lilies and other carefully rendered flowers in their hands also introduce, over and above their symbolic significance, a very robust, earthly element into the exalted heavenly sphere. The fact that Cimabue and Duccio had already freed themselves significantly from the dominant Byzantine style, and had arrived at a more naturalistic treatment of movement, draperies and the distribution of light and shade, is entirely obscured by the force of the revolution wrought by Giotto. His radical change of direction continues to astonish the modern viewer - how much more profoundly it must have shaken his contemporaries. Notwithstanding its Roman predecessors and the influences of antiquity and the French Gothic style, it remains one of the great acts of creation in the history of art. It was improved upon even in Giotto's own lifetime in the work of the barely less important Sienese artist, Simone Martini (c. 1280/85-1344). In comparison with Giotto's sculptural, block-like figures, with their often correspondingly stiff, awkward, even clumsy gestures, Duccio was already painting with a greater subtlety. Where Giotto portrays raw size, Duccio's figures, more heavily indebted to Byzantine tradition, exhibit greater feeling- Duccio's colours, often deeply shaded, shimmer like costly enamel. Although the early works of Simone Martini, born barely twenty years after Giotto, were still characterized by such Byzantine features as the broad bridge of the nose and draperies overlaid with gold leaf, he went on to marry Duccio's achievements both with the new physical type introduced by Giotto and with Giotto's revolutionary understanding of space and architecture. Simone's enormous Maesta fresco in Siena's town hall, depicting the Virgin and Child enthroned and surrounded by saints, is distinguished by a particular elegance and beauty of line. Movements are freer, and faces — highly sensitive and often very serious - are more finely modelled and strongly expressive than those of Giotto. While the bearded heads are still largely indebted to Duccio, the slender youthful heads, many of them with half-length hair curling in on itself at the bottom in line with the fashion of the day, are often more "Gothic" than Giotto's. Simone's draperies are again thinner than Giotto's, and their folds more angular. Compared with the plainness of the Florentine master, what is striking overall is the wealth of detail in both the costumes and the setting. The innovations pioneered by Giotto and Simone are not simply milestones within the history of Italian art. They serve to illustrate the interplay of mutual influences within non-Byzantine art as a whole, as well as the phenomenon of chronologically staggered developments. Just as Giotto and Simone had absorbed influences from France, so they in turn helped steer painting north of the Alps down entirely new avenues. Even before Giotto's death in 1337, one of the four panels making up the altarpiece for Klosterneuburg near Vienna, completed around 1331, quotes literally from the frescos which Giotto executed in 1304—1306 for the Arena Chapel in Padua — one of the first Italian cities which travellers reached after crossing the Alps . The remaining three Klosterneuburg panels also testify to the influence of the great Florentine master in their angular faces, austere gestures and in the foreshortening and decoration of their furnishings. That their anonymous artist was nevertheless rooted in the contemporary trends of the North is demonstrated, on the other hand, by the greater animation and curvilinear silhouettes of his figures, and above all by the loose draperies with their richly undulating hems in which they are clad. A good ten years later we encounter Italian influences again, this time a little further north in Prague, Bohemia, which under Charles IV (1316-1378) became the seat of the Holy Roman Emperor and thus the political as well as the cultural capital of the entire empire. The Bohemian Master of the Glatz Madonna and his somewhat weaker follower, the Master Hohenfurt cite Italian head types more faithfully than the Klosterneuburg artist, while the folds of their draperies continue to reflect the tastes of the North. 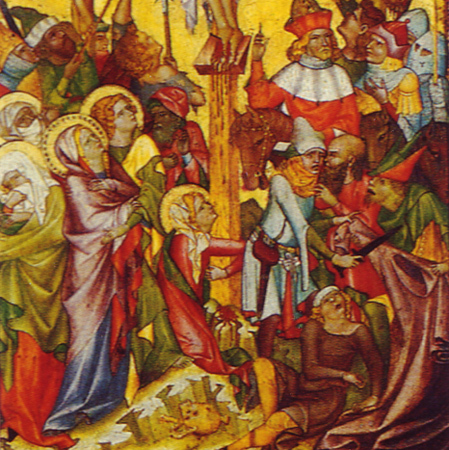 As the Kaufmann Crucifixion demonstrates, an exquisite palette featuring striking orange accents becomes characteristic of the Bohemian school, although it could also be seen as a reference to earlier Sienese paintings. The same might be true of the sumptuous detailing of the draperies of the Christ, donor and angels in the Glatz picture. The large panel was originally surrounded by smaller scenes from Christ's childhood, as was the convention in Italy. This was no coincidence: to underline his imperial status, Charles IV was quite blatantly seeking to compete with the leading artistic centres of his day — which meant Tuscany and Paris — and if possible even to surpass them. The Italian influences finding their way into the Klosterneuburg altar were also being felt strongly in Paris, where the French court was the most spoilt for artists of any in Europe. In 1309, under pressure from the French king Philip the Fair, Pope Clement V (1305-1314) moved his residence from Rome to Avignon, which was closely allied to the French crown lands. He was followed not just by cardinals and the papal court, but also by Italian artists, including for a short time possibly even Giotto himself. Simone Martini certainly spent time in Avignon. He was destined for employment at court not only by the extremely sophisticated elegance of his art, but also by the close contacts he had developed, while still in Italy, with the Anjou family, the then rulers of Naples. The panel paintings which Simone executed after 1336 are now scattered, but important fragments of his mural decorations for the palace chapel have survived in situ. As a result of conservation measures undertaken in this century, it is even possible to distinguish between the various stages of their execution. The rather damaged frescos themselves have been detached from the detailed preparatory drawings, or sinopie, underneath and these separated in turn from the original sketch, which remains in its old place. The sinopie, hidden for six hundred years, thereby reveal the delicacy and freedom of Simone's drawing more directly than the finished painting. From Avignon, the exquisite linearity and powerful, delicate colours of the Sienese artists exerted their influence not only upon the Paris court, where Pucelle Jean (active c. 1319—1335) drew upon them to arrive at a new plasticity and sought to achieve a uniform perspective, but also upon nearby Aragon across the Pyrenees. Even the Sienese elements of Bohemian court art may have reached Prague via Avignon rather than a more direct source - men such as the bishop who commissioned the Glatz Madonna were bound to have spent time at the papal court. Nor should we underestimate, in this context, the extent of the artistic exchanges taking place in Avignon itself. According to records, the Italians were working alongside English, Catalan and, in particular of course, French artists.